People experiencing homelessness have few places to sleep at night, let alone access health services. Among them is Oscar Salas, who has been homeless for a year. Recently, the 62-year-old has been experiencing high anxiety and frustration. But Salas was able to get help after taking advantage of free health screenings offered at the first H.O.P.E. (Health Opportunity Prevention Education) Health Fair at the Opportunity Center on April 11 and 13, 2016. The health fair gave residents of the Opportunity Center, the Salvation Army, the Rescue Mission of El Paso and the Centro De Los Trabajadores Agrícolas Fronterizos (Border Farmworker Center) an opportunity to get preliminary diagnosis on diseases such as diabetes that might otherwise go unnoticed. Organized by The University of Texas of El Paso, the two-day H.O.P.E. Health Fair leveraged the resources of 11 community partners to address the basic health needs of 199 homeless or uninsured individuals in El Paso. Partners included UTEP’s College of Health Sciences and the School of Nursing, the Opportunity Center, San Vicente Family Health Center, the El Paso Department of Public Health, University Medical Center, the Texas Department of State Health Services, Aliviane Inc., the Hospitals of Providence, McCrory’s Pharmacy, Walgreens Pharmacy, and Spice is Not Nice. “It’s complicated to get these (health) services when you’re uninsured or underinsured, especially if you’re also having to deal with other issues like being home free or not having a regular place to live,” explained Eva Moya, Ph.D., a UTEP College of Health Sciences associate dean and social work assistant professor. Moya and Guillermina Solis, Ph.D., assistant professor of nursing, spearheaded the project. “We have a wealth of resources in this community, and if we can come together through partnerships, more of these services could be provided on a more regular basis,” Moya said. 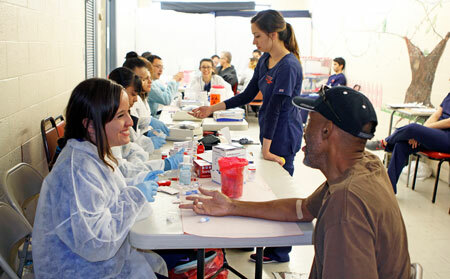 More than 80 UTEP students from the undergraduate nursing program, clinical laboratory sciences, social work, rehabilitation counseling and pharmacy screened participants for diabetes, anemia, high blood pressure, high cholesterol and other conditions. They also offered information on tobacco cessation, diabetic foot care and mental health screenings. UTEP clinical faculty members reviewed the test results. Participants with abnormal test results were referred to San Vicente Family Health Center for follow up care. Ray Tullius, executive director of the Opportunity Center and a UTEP alumnus, said it was nearly impossible for residents to get the level of care that they received during the H.O.P.E. Health Fair. For nursing students Daniela Lopez and Mario Herrera, the health fair was an opportunity to practice their skills and learn about the health care needs of the city’s homeless population while giving back to the community. After being tested for HIV and syphilis by the El Paso Department of Public Health, Jasmine Aranda made her way to the clinical laboratory sciences students, who checked her blood glucose levels and did a urinalysis test. The Public Health Department also tested participants for tuberculosis and Hepatitis C. Pharmacy students offered flu vaccines donated by McCrory’s Pharmacy and Walgreens. Students in the Master of Social Work program screened participants for depression and anxiety. They passed out cotton balls soaked in lavender as a form of aroma therapy to help people relax. For her thesis project, Krizia Mendez is facilitating a study looking at mental health and homeless individuals at the Opportunity Center. Participants responded to a patient health questionnaire, which was used to detect depression and anxiety. Those who scored moderate to severe were referred to San Vicente Family Health Center for treatment. They were also given a list of low-cost mental health providers in the community. Ervin Smiley had his finger pricked to test his blood sugar and cholesterol levels. “I’m getting old so I have to see how the body is holding up,” Smiley joked. The 56-year-old works in the Opportunity Center’s Safe Haven facility, which houses single men and women with mental disabilities. Smiley gave UTEP students an A plus for making a difference in the community. Organizers are planning to host a second health fair at the Opportunity Center later this year.